Truly unique. I mean, how often do you get to read a book narrated by Death himself…? It’s 1939. In Nazi Germany, Death’s getting busy. 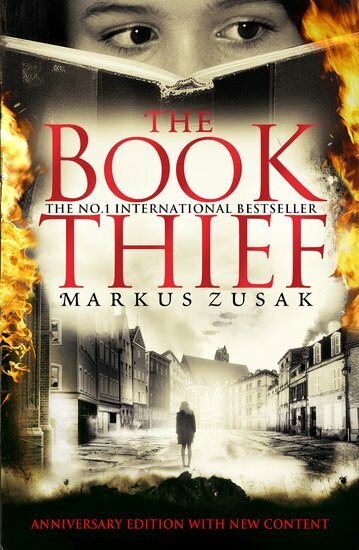 And while he takes lives, Liesel steals books. When Death starts getting too close, can a story help Liesel survive? The shadow of the Holocaust is looming when Liesel finds the book that changes her life. Abandoned in the snow: The Gravedigger’s Handbook. The start of her love affair with books. You’ve heard of a kleptomaniac? She’s a booktomaniac. Soon she’s stealing books wherever she can find them. When Liesel’s foster family hide a Jew in their basement, can her love of stories keep them all alive…? I absolutely loved this book! It was not the usual type of book I read but the impact on me from this book was amazing. Though it was very sad the very end of the book made me nearly cry through happiness!! I would definitely recommend this book to teens and adults alike, it is the most meaningful book I’ve ever read.